(Originally posted on Activating TOK) Today, a PS to this past week’s posts on classifying human beings. What do our categories highlight, and what do they exclude? My past two posts have used current examples from the media to raise knowledge questions about “race” and the contentious balance between biological heritage and culture or ethnicity (a balance that carries varies labeling in various contexts). Today I’d like to comment, just briefly, on another classification of human beings, one that carries enormous significance for how we live in the world – in the creation of the category to begin with, in the definition of the category in law and politics (implications! ), and in the way the category tests our common humanity. I’m referring to the category “refugees”. I feel that TOK has a role to play in invoking not only the ways of knowing that most effectively slot particular phenomena into their generalized boxes, but also the ways of knowing that invite us to think beyond those boxes and awaken compassion.There is no “refugee gene” and no biological inheritance that places someone in the group “refugees”. The causes are social – and we have to look to the human sciences for explanation, perhaps all of psychology, sociology, history, and political science. We also look to politics and the media. As we consider classification in TOK – a topic that crosses all of our areas of knowledge – we want to keep raising for question the differing bases on which we categorize (all WOK involved), the role of definitions in our shared knowledge (notably WOK language), the personal and shared associations that categories gather (notably WOK emotion, memory, imagination), and the implications of classifying for what knowledge we gain and how we gain it. As highlighted in the TOK knowledge framework, our opening concepts create the rails on which our thinking runs — the extent to which is does being explored in the topics of TOK language as a way of knowing. Regarding “refugees”, I have only two points to make – and invite you to comment if you have others. First, the category raises huge challenges of definition, with the definition being highly problematic yet carrying major implications for how individuals may be treated in a place of asylum. I recommend an article from IRIN: “Refugee versus migrant: time for a new label?” This “label” provides thoughtful material to raise knowledge questions in TOK and illustrate the importance of asking them, , with special reference to language as a way of knowing and the category of “concepts/language” in the TOK knowledge framework. Second, the category “refugee” does what categories do, for both good and ill as we build knowledge: it highlights certain features that people have in common and leaves out of the picture other features that are not relevant to the label. Here, I recommend two articles that, with their personal stories and photos, invite us to question what is often assumed about the category “refugee” and to think beyond that box. Sometimes, I’d say, our categories are too big and too general to let us see the individuals within them, but too small and too limited to encourage us to see the humanity we share. The second (and last) article I recommend is one that looks not primarily at the terrible situation of many refugees but at individual stories of what people have done to help. 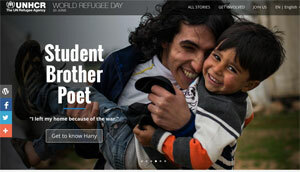 “World Refugee Day: stories of everyday heroes helping Syrian refugees”. Again, it uses a category to gather examples of people to present in the article, but within that category gives us pictures and stories to personalize the situation. It roots the general in the particular in a way familiar to photography and literature and, in the process, stirs to a greater degree our (WOK) emotion and imagination. I can’t go so far as to suggest that these two articles – one on refugees and one on people who help them — also stir in their readers the question “What can I do to help?”. I haven’t done a survey, so that would be purely data-free speculation on my part. Yet I do wonder if imaginative engagement, even if not sufficient to provoke action, might be a necessary ingredient toward compassion and the desire to help. TOK does not have the role in the IB of explicitly educating on global issues or taking action as CAS does. Yet I think it has an important role to play in helping students think clearly about how they put labels on their world, and helping them recognize the implications of categories for what they know and how they act — in areas of knowledge and in the communities that surround them.